It’s the season to be thankful (queue festive holiday music) but it’s also the season to be careful, especially if you’re going on holiday during this festive season. Hotels are flooded and rates are skyrocketing as the demand for accommodation increases and space becomes limited. In comes Airbnb to save the day. It is described as a peer to peer marketplace to rent short term or long term accommodation. The owners of said rentals will set a price per day or per month, and you may receive discounted rates the longer you stay. Some places will cater to animals or smoking while others will not. You could rent a room, an apartment or even a house – it all depends on you and your needs at that specific time. For professionals who need to travel for work, Airbnb is a blessing in disguise as it has generally been much cheaper than staying at a hotel. However, as with everything in the digital age, there will be someone out there trying to take advantage of unsuspecting holiday-makers. Online scammers or online con-artists are extremely clever and have no compunction about taking your money. Remember, these days any website can be cloned or copied to look like the real page. This fake site will have every single detail in place except for a few things. Generally, Airbnb does not have a chat option and it will not link you to a different site. This means that you need to actually submit a query to Airbnb and there is no live chat support available to ‘help’ you. The real website will never ask you for personal information. In the URL input section if a site is safe, it will show a little lock icon. Always view the site information by clicking on that little lock, it will tell you that the site is secure and a valid HTTPS. Pay attention to spotty syntax and other language errors, no professional company will tolerate that. Most companies will also hire native speakers of foreign languages to communicate with their foreign clientele if they have any questions. Airbnb has its own payment methods in place. The minute you pay ‘outside’ of the website, the more likely you are to lose all of your hard-earned money to an online con artist. If you’ve been through the original website, you’re bound to notice the general price of apartments depending on the sizes and the perks. So if an apartment looks like a dream and comparatively costs next to nothing, then chances are it isn’t real. Please be careful this festive season. 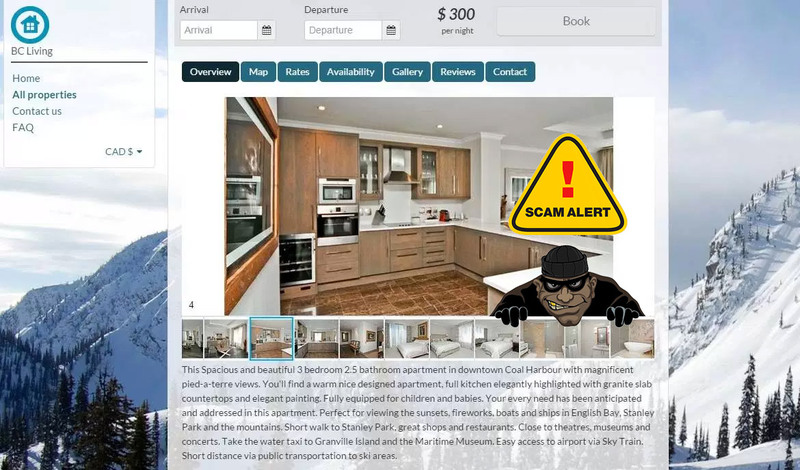 Online scammers are looking for any and every chance they can get to take your money and there’s nothing more depressing than losing hard earned money by being foolhardy. Yes, you may seem over zealously cautious when it comes to sites like Airbnb but rather be safe, than sorry. Contact their support page directly with any questions and always remember to check the URL of any site that you’re using.